I’ve been crushing on the ceramic bells I’ve seen pop up in a few of my favorite stores all summer, so it was high time I tried to make something similar myself. These are purely for decor and don’t actually make that lovely sound that hand-thrown clay bells make, but they sure look fancy on my wall. These have a bit of a summer vibe but would also be easy to gild with some metallic paint for the upcoming holidays. -something flat and long to cut through your clay such as a popsicle stick, ruler, etc. Step One: One block of clay (shown above) can make a larger bell or two smaller bells. Roll your clay until smooth. Step Two: I split each of the two balls of clay so that I had a smaller piece and a larger piece. The smaller piece will be the top of the bell and the larger piece will be the tube. They should look like the two pieces on top. Then I stretched my large piece into a long, rectangular shape and flattened my small piece into a circle, like in the bottom two shapes. Step Three: Roll your rectangular piece flat. Use your popsicle stick to help flatten the top and bottom edges. Also use it to cut the rounded ends off as shown above. You want your clay to be about 1/4″ thick. Keep your excess and use it to make the circular top thicker. Step Four: Roll your rectangle into a tube shape so that your edges overlap about 1/4″ and press them together. If you press them together against the table, it’ll keep a smooth outer edge. Step Five: Gently rub over the seam on the outside and smooth it out. Step Six: Round the edges of your top as shown. Step Seven: Place it down into your tube. It should fit snugly. If there is a gap, take it out and try again. Step Eight: Press the edges of your tube around your circular shape. Then gently smooth the seam out. This takes a little practice, but clay is forgiving. You can just start all over if you aren’t happy with it before you bake it. Step Nine: Smooth out the seams on the inside of the bell as well. Then place a popsicle stick down into it to make the hole in the clay. I used leather cord so this was the perfect shape. If you use yarn or twine, you can use something with a similar shape to make your hole. Step Ten: Cut your copper pipe according to manufacturer directions. I trimmed mine down to 2″ and 3″ pieces. Step Eleven: This is the cord I found at my large local craft store. It comes in a few colors. You could also use paracord, thick twine, yarn, etc. Step Twelve: Cut about 15″ of cord and tie a knot about 2″ from one end. Step Thirteen: Place your copper pipe over the short end of the cord and press flat with pliers to secure it to your cord. Set aside. Step Fourteen: Before you paint your bells, stick them onto a cookie sheet or baking tray of some sort and follow manufacturer’s directions for baking. Mine needed 15-20 minutes at 275°. Wait until they’ve cooled, and then feel free to paint them. I taped off one section of the bell for a smoothly painted edge on one, and then just free handed stripes on the other. I also used a pen to illustrate x’s on another. Once your acrylic paint has dried, you can add gloss over your bell for a ceramic look. Step Fifteen: String your leather cord up through the bell. Then tie another knot gently on top of the bell so it stays put. I then tied a loop knot on each bell, but you can also tie all of the cords in one large knot together. 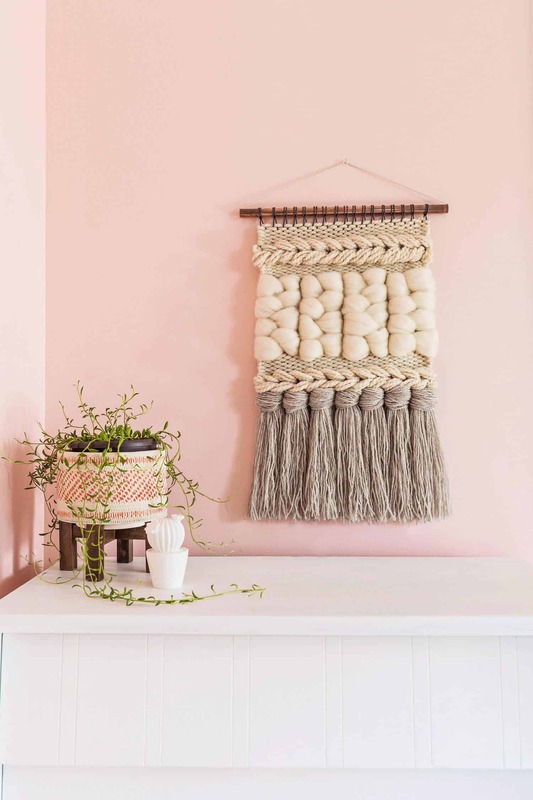 You can tie them all together at the top after making them different lengths or bundle them three at a time on a decorative hook or a door handle that isn’t in use. They aren’t terribly fragile if bumped around gently, but I wouldn’t advise using them on doors that are used regularly. Credits // Author and Photography: Rachel Denbow. Photos edited with A Beautiful Mess actions. It is so nice and special. Love it! Actually, I love just about anything made with clay!!! These would be really cute in my kitchen. SO cute, and totally unique! If you added two of the copper pipe pieces in side of the bell it would probably make noise. Anyway I love this idea they are beautiful just like everything else on this blog!! These are so cute! They would make a unique house warming gift too! I love all of the clay crafts you’ve been doing lately – I didn’t know you could do so much with those small packs of clay! I love the colour selection for the bells. I love these! Great colors and patterns. Such a fun idea for gifts as well – I can see bells with blue, silver and glitter for Christmas time! This is such a cute gift idea as well! I can see bells with blue, silver, and glitter for Christmas time! I love these decorative bells! I definitely think that these would make great holiday decorations if you switch up the colors, but these colors are so beautiful too. I might just have to make a couple of sets, and switch them up during different seasons. You have brough sculptey to a whole new level! Love this idea! Thanks for sharing! So pretty! I would love to make these holiday themed for gifts. These are so beautiful! And SO SIMPLE to make! I don’t know why I’ve never ventured into playing around with oven bake clay before! I feel a Micheal’s trip coming on… Again! I love this, would make great gifts! loving all the clay crafts lately! Love these bells! Need to find a store or webshop that sells clay in the Netherlands so I can make some of these cuties. These are too fantastic. They would look great in my little sisters room, I’ll have to make them for her. 🙂 Thanks for the awesome diy! So fun. Such a creative and simply DIY! Love it! This is just … GREAT!!! I totally loved the idea (and the patterns and the colours!). Thank you!!! Love the look of the leather suede. This is the perfect project for Sharpie paint pens if you want a little more control over the shapes and lines! I love love love these. 3 loves. 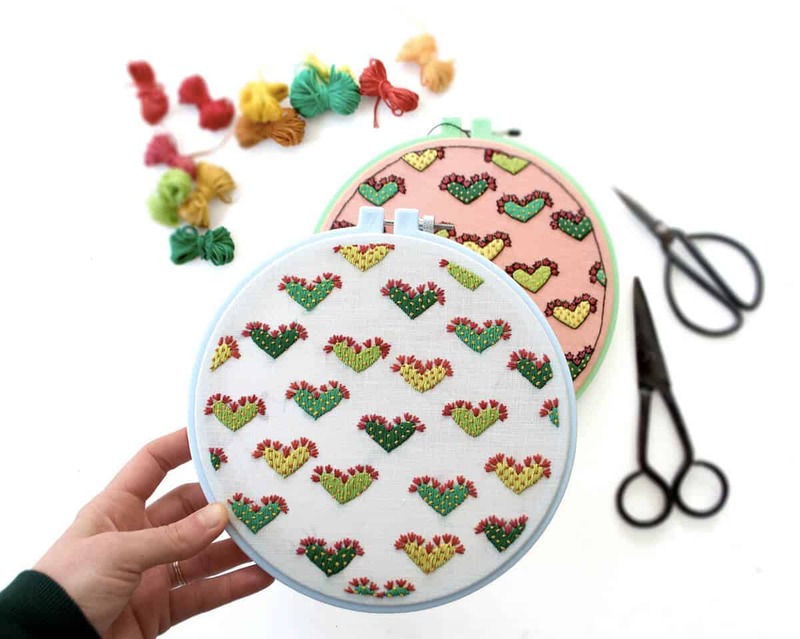 These are adorable and it’s such a versatile idea! Love this DIY, Rachel!